By achieving fast forward discoveries in medicine and science, the sunny weather, as well as the higher standard of living in the UAE, individuals are living longer than ever before in history. 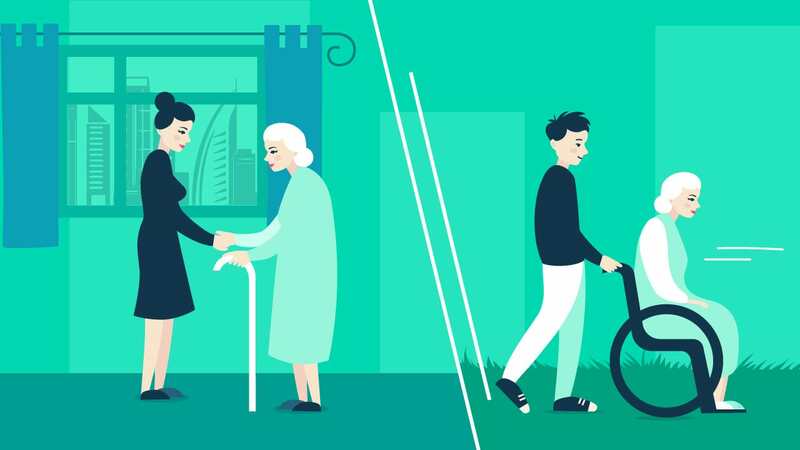 As a result, more and more elder people are in need of receiving elderly care in their retirement years, while their families are digging through the pool of newly-established companies and agencies offering wide range of services for those who are in need of assistance in taking care of themselves. We can agree that it is observed as a fact that many senior citizens prefer to enjoy an “age in place” by spending their later years in their own households or places where they spent the majority of their active lives, especially when confronting the somewhat outspoken and outdated concept of being abandoned by family in old “nursing homes.” However, today’s senior people can enjoy a wide variety of options in what and how the last stage of life will look like in the years to come, including possibilities for active seniors who simply want to slow down, or seniors with some medical conditions that would appreciate easy access to medical care. In any case, there is a lot of misperception about the different categories of senior living existing today, but three of the most popular forms of senior care are assisted home care living communities, assisted day-care centres and nursing homes registered with Dubai health authority. One way to characterize the difference between nursing homes an assisted living facility is to describe the first one as more hospital-like and the latter as more home-like. Assisted living can be done both in the home of the person or in specialised home-like day centres. While home care services operate on a non-medical model, the distinction between a nursing home versus a day-care centre option can seem a little indistinct. 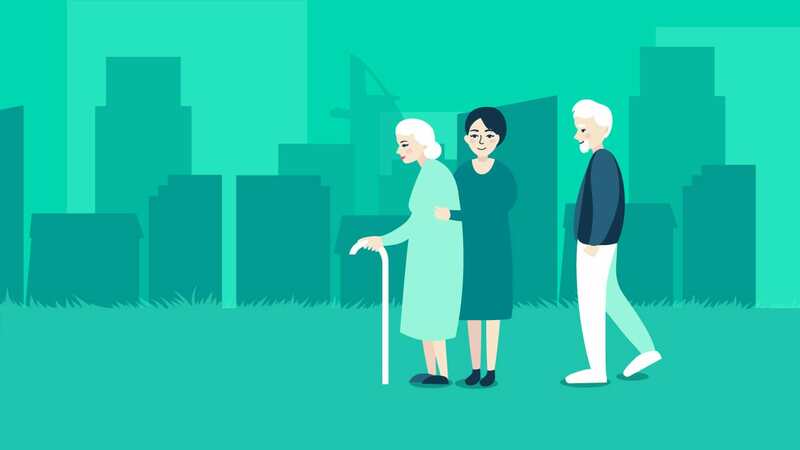 You can also find out more about types of elderly care in Dubai by visiting popular services aggregator such as help4u.today and check various options and ideas on what is the best option for your family. Assisted living in-home care In-home care includes a wide range of services that give the liberty to seniors to keep on living in their beloved home for as long as possible. Home care can be made up of various services starting from assistance with running basic chores, cleaning, food preparation, and even dressing or bathing. Depending upon the home care provider and the agreed conditions, basic medical assistance might be provided. These assistance providers might work in different shifts, full-time, part-time, or even on-demand basis. Availability. Round the clock, 24/7 availability of these services. It is up to you to book with a private care giver or choose to work with an agency that specializes in home care services. Social Interaction. This is one the weak points since those who opted-in for in-home care often feel isolated. Committing yourself in obtaining plenty of social interaction options can help in avoiding or overcoming those feelings of isolation and desertion for your loved ones. Cost. The cost of booking home care services varies immensely depending upon the variety of services required. Personal care assistants or companions cost generally similar amounts but offer different services. Insurance. Some private insurance companies may cover certain types of in-home care. UAE nationals can apply for various public funds and support plans and get state support as well. Independence. If your beloved family member can or prefers being left home alone for longer stretches of the day, occasional in-home care might be agreed and provided as a part-time support. Assisted Living - Adult Day-care Centers * Availability. Older people day care centre services are usually available only during the day, and during working hours in a regular work week. If there no one else to take care of your senior family member for after working hours since you have to be away for other reasons, it might be necessary to hire in-home care for the period after work hours or for the times adult day care is not open. * Social Interaction. Feelings of isolation can quickly erupt to depression. Adult day care centres provide the stimulation your loved one needs by giving him/her the pleasure of a company by other guests and people of his/her age. This helps in fostering a feeling of a productive, active member of society. * Cost. Depending upon the services provided, adult day care can offer services on a sliding pay scale. Average costs are slightly lower than in-home care providers. * Types of Care. Basic packages offer socialization, overall support, basic meals and medications, as well as a change of pace. These centres might cater for some medical therapy, especially physical, psychological or speech therapy. Some of them have tailored services and staff to handle seniors in the early stages of Alzheimer's or dementia. * Insurance. Most private insurance companies may cover the cost of adult day care if it is prescribed by a physician. * Independence. Intended for those who cannot be left at home alone and who need the daytime supervision in adult day care. Nursing Homes * Providing assistance in daily living (personal care) - nursing homes provide care for senior individuals who are in need of a higher degree or a more frequent medical attention than those sorted out in assisted living. * It provides medication and prescription management and administration * Have availability of registered nurses and skilled nursing facilities in their premises * Limited medical treatments and limited recreational activities with included supervision by a nurse and care giver * Meals, laundry, housekeeping * Suitable for people who require extensive personal care, having difficulties in movement without assistance, require daily regular medical care, have advanced cognitive problems or are facing some other behavioural problems * Most nursing home residents are permanent residents in such centres because they have continuing physical or mental impairments that require constant care and supervision by professionals. 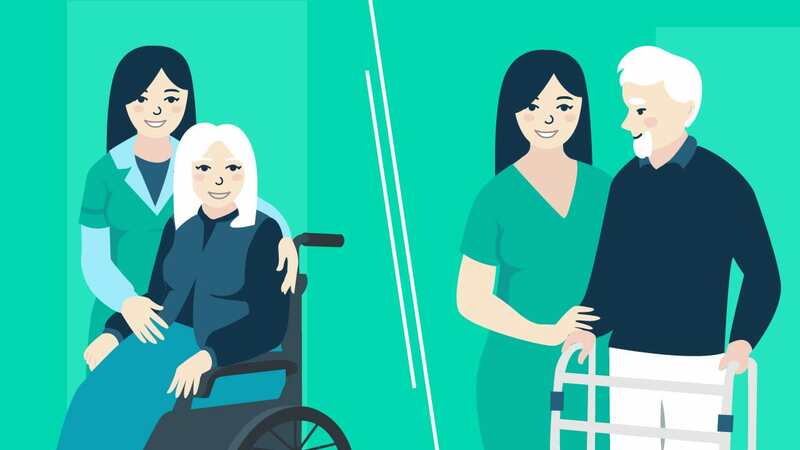 The biggest differences between assisted living and nursing homes as main elderly care options are perceived through the medical services provided. Nursing home residents are in need of a permanent and focused care and monitoring. Intended for people with more complex health care conditions requiring a registered nurse or maybe a physical or speech therapist. Some require respiratory care services. On the other note, an assisted living community generally offers custodial care for people who live with memory loss and aren’t safe living alone, adults with mobility problems or people who are still not in need of an institutional approach but rather an assisted support. Nursing care centres generally give away a more institutional look while an assisted living usually bear a resemblance to an apartment community. It is a common thing that nursing homes had an image of being more restrictive, where people were isolated or cut off from friends and family, however, on another note, with advancements in technology, particularly scientific and medical and by having the availability of being in the company of more people, nursing homes are going as higher on the list as possible. 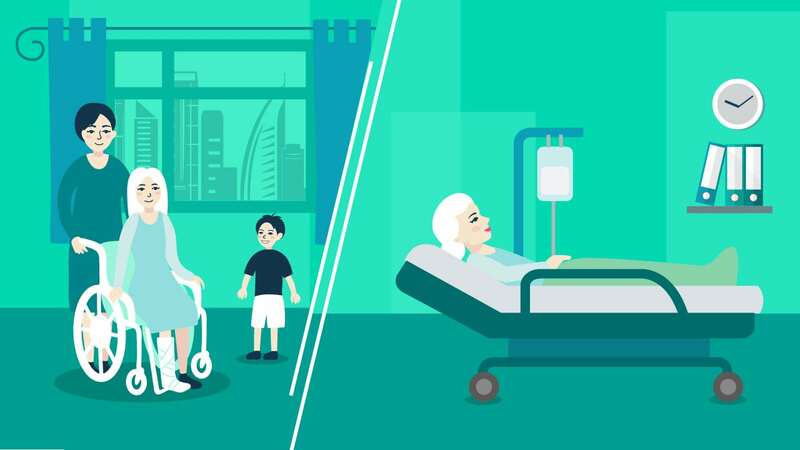 Caregivers in Dubai almost always prefer adult day care to a nursing home because they can spend as much time as possible with their loved ones without disrupting their own schedules. Also, adult day care is a more cost-effective option than home health nursing, which is important taking into consideration the high-costs of all these arrangements and the living standard. The most important aspects of using the services of one of the types of centres is for our beloved elderly family members to feel as much as comfortable as possible. There are certain benefits which influence the final decision on which one to choose: * Medication Management: Medication mismanagement is one of the leading reasons why seniors often visit the emergency room. This is not an easy task, especially for people who take many different medications each day. Both types of assisting communities offer their residents a safe and timely management of their medications. * Life Enrichment: We all agree that isolation and loneliness increase the risk for health problems, such as depression, diabetes and high blood pressure. Assisted day-care living communities and nursing care centres promote various life enrichment activities designed to satisfy the residents’ physical, emotional and spiritual needs. * Supportive Services: Both types of communities cover the need for support with tasks like housekeeping, laundry and transportation. * Secure Environment: What they share in common is that they are designed with handrails and grab bars to emergency call systems, aiming to help residents stay safe. * Well-Balanced Meals: Good nutrition is on the top list of priorities for adults who may be struggling to plan and prepare meals at home. In such a vibrant city as Dubai, there is a plenitude of available options, centres and facilities who offer multiple types of services, plans and are available to meet many specific needs. You can always rely on help4u.today and book home care services without a hassle and secure your peace of mind. Feel free to share your experience with people who are facing the similar challenge and help in promoting the community.